January | 2010 | I do want to do something. I am starting with 98weeks a research on arabic/ Lebanese culture and arts magazines, published from the 50s on. The idea is to collect and present these books in the Bidoun Library in April 2010. I have found this little kitab book that I really like. It was published in Egypt in the 50s. I have just read out loud Benjamin’s essay on book collecting, Unpacking my Library.His essay arose a couple of interesting thoughts in relation to archiving, the public and the private. I first was slightly disturbed by the overtly passionate description of collecting and the atmosphere that accompanies it; an infinite quantity of dusty and chaotic crates containing books with each a singular history and memory. Benjamin moves on to describe the chaos implied in a collection (which is also associated with a chaos of feelings and affect; one could kill to have a book), to the precarious order of classifying and arranging these books. As I have understood it, one does not goe without the other (and indeed if there is a counterpart to the confusion of the library, it is the order of the catalogue” ). Passions for book collecting also do not go without a particular economy, the one of property, or more precisely of possession. How does a collector acquire his books and how does his relation to books determine the act of collecting? A collector is a book borrower that does not return the books; his act of purchasing must also be accompanied by the ritual of it; meaning that to acquire books in a conventional bookstore won’t do. His acquisitions are linked to particular cities and journeys that comes with memories of hidden bookshops. An enterprise that is similar to a quest that resolves itself in an encounter between the book and the collector. In this encounter, something is brought back to life. Factors such as previous belongings, the edition, the printing press ect… are also crucial parameters in this encounter. The particularity of acquisition activates an economy of loss since the property of the object is material but also shares a border with life. It is an intimate property rather than a private one. This is the reason why, when a collection becomes public, it looses what made it a collection, mainly its collector. The collection seems to be the impossible relation between life and the object. This is the diagram that Plato brings a slave boy to draw in his dialogue with Meno. 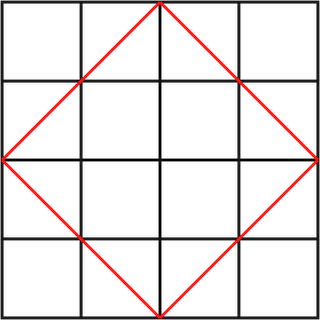 Plato asks Meno how to double the surface of a square that is composed of 4 little squares. Meno’s first move is the double the side of the square, but the side is not a surface; by doubling the side, we end up with 16 sub squares, not the desired 8 ones. Plato says to Meno that in order to reach the double of the first square, he has to think in surfaces and that he can’t deduce the surface from the sides. For Socrate, one has not to forget what one is seeking during the calculations (Meno forgot that he was looking for a surface). We can reach knowledge if we do not forget while we are seeking. Another interesting point in this demonstration is that Plato beging with a large surface from which he has to deduce the resulting double square, meaning that he proceeds by subtracting (on a surface of 16 squares, I will find the surface of 8 squares which is already contained in the larger surface).Plato proceeds by subtraction, not by addition. The final act is to delimit, not to find. To trace the line will make the answer visible but the answer is already contained in the question. If it is not , I will never see it. The paradox is that we reach the unknown from what is already know. I have been thinking about this for a while now, gathering some feelings of discontent on a couple of issues pertaining to the relation between research, art and the art system. I started thinking about it when a couple of artists whom I know have expressed the same concerns in regards to their research. The artists had received great attention on their projects by established institutions, an attention which resumed in an immediate almost frantic desire to appropriate the research and place it under their label, wing or support. Coincidentally, but maybe not, the artists were working with archival material and carrying a research on Lebanon’s past history, although in a rather oblique manner. One of the artist reported that he first mentioned his project to another artist, who told him “ you have a great treasure here”… The artist received attention from different organizations that resembled a sort of competitive race towards. What is the race towards or against and how does it condition the nature of the knowledge pertaining to the work and its research? If knowledge is a race for information (who is the first to know) and then a property (a knowledge that is placed under a certain program or institutional name or copyright) knowledge is to be understood as piece; quantifiable and consumable. The more you have information, the more powerful you have because the more marketable it makes you on the art scene. The question, what is it that you know, remains. I remember an animated debate that took place at the BAC between a gallerist and a curator; the curator was accusing the gallerist of “possessing” an archive and a collection of great value and of withholding it form the public as to capitalize on it. The dynamics of what is at stake is linked to who possesses what and how, what forces are at play in that possession and what power game is being played; local heritage against global market, local institutions against global institutions, the market against the non profit etc. These antagonisms maybe due to the lack of public body or institutions to safeguard knowledge and research from private enterprise (which is also linked to private initiatives). Another question that imposes itself and render this competition all the more problematic is; how does it affect this knowledge in its particular relation to history and the archive. What is the role of the archive in producing knowledge ? Is it to know that something happened or is it the power that resides in constituting a narrative on a historical episode. The paradox in the knowledge/ history/ artistic practices is that the narrative is intrinsically linked to the artist’s reading of this material and remains an individual enterprise.